This Portable Single Burner by Secura is a well-designed countertop burner that’s lightweight and versatile for various cooking needs. It has a digital panel for quick set up of cooking specifications and can be used in conjunction with various induction-ready cookware. 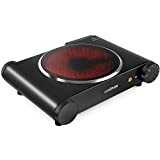 Integrated with 15 power levels, this portable single burner boasts of 15 temperature settings between 140 to 460°F and is powered between 200-1800W. Other notable features of this appliance include auto-pan detection, diagnostic error-message system, low/high voltage warning system. This portable single burner is ETL approved and is built to conform to North American Electrical Standards. 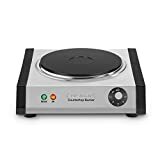 Equipped with a count-down digital timer, this portable single burner can go up to 170 minutes with increments of 1 minute. Compatible Induction ready cookware that can be used with this burner include Cast Aluminium enameled Iron and Steel, Stainless Steel or Cast-Iron cookware with a magnetic bottom. 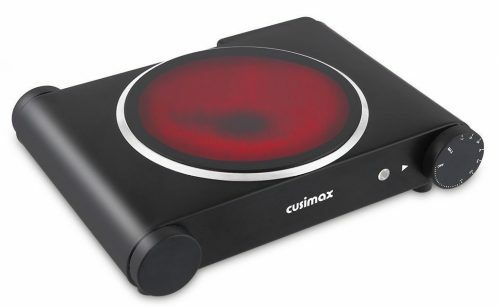 This Portable Single Burner model from Cusimax is available in two models namely; the Single Infrared Silver Cooktop and the Double Silver Hot Plate. The CMIP-B120 is a ceramic cooktop which is a very light and compact device that can adapt seamlessly to various cooking environments. This Infrared Cooker heats up instantly and creates even distribution of heat to the pan resulting in fast and efficient cooking. It is multifunctional and it displays high thermal efficiency with its ability to reach high temperatures almost instantaneously. It is built for safe cooking since it comes with an automatic shut off function that powers off the burner after every use. Its also equipped with a thermostat for temperature control. Highly adaptable since a variety of cookware including pots and pans spanning up to 7.1 inches, glass, and aluminium utensils can be used with it. This Induction Cooktop by Aicok is a touch-screen enabled induction cooktop with advanced induction technology for safe, quick, and excellent cooking results. The LED display and sensor touch on this induction cooker allows for convenient usage. All the important cooking programs including fry, simmer, warm, gruel, stew, stir-fry, and hotpot have been integrated with this burner. 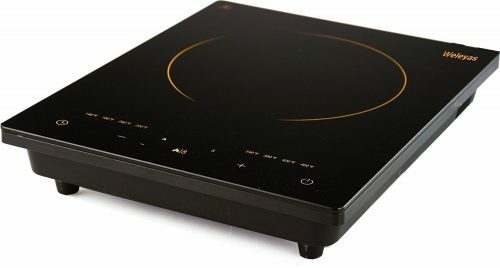 Specifications on this Induction Cooker are as follows; 120 V/ 60 Hz, 1500 Watts, and a temperature range of 140 and 460°F. 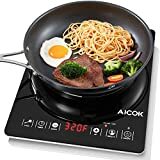 Compatible cookware with this portable single burner includes pots and pans ranging from 12 to 20 centimeters, made from Steel, Cast Iron, Enamelled Iron, Stainless Steel, and Flat-Bottom cookware. Other interesting features include Child Lock, Electronic Overload protection, and Pot Recognition Technology. The Polished Crystal Plate and Panel Control Sensor make for a hassle-free cooking experience. This Portable Single Burner by Secura is a beautiful countertop cooktop and is a recommended kitchen portable single burner known for its compactness. This is an energy efficient portable single burner which utilizes 90% of energy taken from power source. Technical specifications on this product are 120V, 15 Amps, and 10 power levels between 200 to 1800 Watts. Notable features include Auto-Pan Detection, Diagnostic Error Message System, Low-High Voltage Warning System. 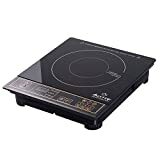 Another feature of this induction cooker that displays splendid energy efficiency is the self-adjusting burners on this device which automatically detects cookware base size and adjusts energy use to minimize loss. 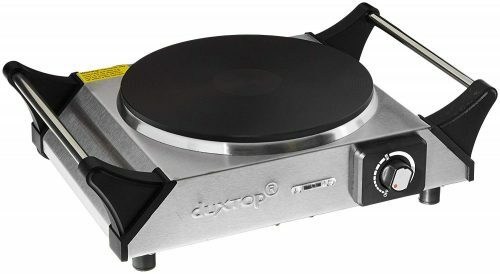 This next Portable Single Burner by Duxtop is a single countertop burner with cool touch handles and compact size for convenient usage, moving, and handling. This device works best on 120V/60 Hz AC, is designed according to North American Electrical Standards, and is ETL approved. 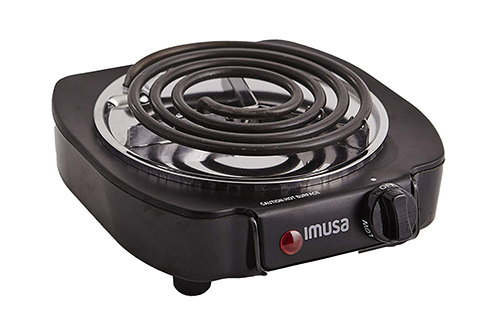 The Heating plate on this device is 7.5 inches in diameter which is spacious for cooking with a variety of utensils. The body of this cooker is composed of a cast-iron plate which is enclosed in stainless-steel housing. The adjustable thermostat on this device enables safe, energy-efficient cooking. It also has a heating indicator light which is very useful for maintaining safety. This Portable Single Burner by Weleyas is an Electric Induction Countertop Cooktop with a stunning design. 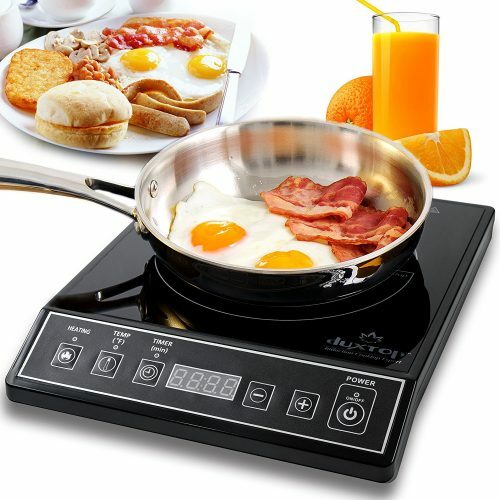 This is a highly versatile cooktop available at an affordable price. 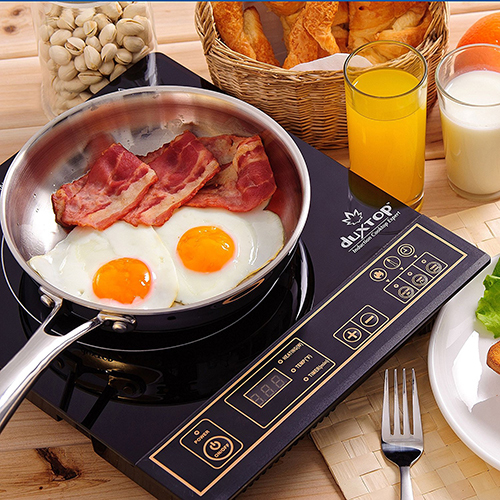 Specifications of this cooktop are 1800W Max Power with 8 temperature levels ranging between 140 and 460°F. 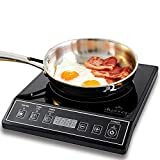 Various cooking functions in this cooktop are as follows; Braise, Simmer, stir-fry, deep-fry, roast, sauté, steam, hot-pot, shabu-shabu, and Boil. Important functions included are the Diagnostic Error Message System and the Low-High Voltage Warning System. It is highly energy efficient in that the magnetic field directly supplies heat to the cooking vessel. Safe-cooking is enabled since the cooktop doesn’t get hot except for directly under the cooking vessel. 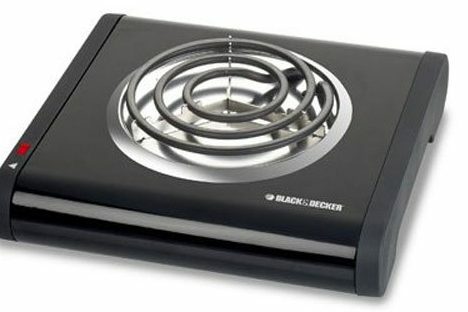 This Portable Burner by Black Decker comes in two models namely; the Single Burner and the Double Burner. The Single Burner cooktop is exceptionally light and portable. 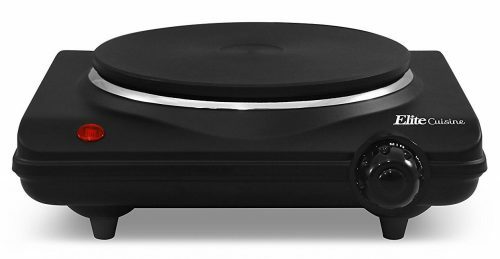 The single burner coil on this induction cooktop enables even heat distribution for safe, fast, and easy cooking. It comes with a variable temperature knob that can be used for various cooking preferences or simply to heat food. There is a power indicator light for safe usage and to eliminate the probability of accidents. This product spans 12.2×5.4×11 inches and weighs 2.2 pounds. This Portable Burner by Elite Cuisine is an Electric Hot Plate that is excellent for consistent cooking needs. It’s incredibly compact because it requires very little space on your kitchen countertop. Elite Cuisine has Single Buffet Burners and Double Buffet Burners. The Single Buffet Burner works on 1000 Watts. It comes with an adjustable temperature control knob with three settings namely; Low, Medium, and High. It also has a power indicator light to let everyone know when it’s hot and cooking to avoid burning of the fingers. This burner sits perfectly on countertops since its rubber feet renders it stability during use. The Single Burner only requires a plug for cooking and very less space. It has efficient Heat Distribution Coils that allow for energy-efficient cooking. This product has a power indicator light and a temperature regulating knob. 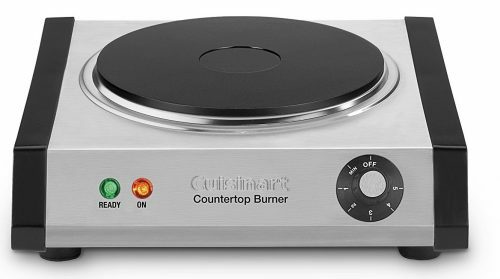 Cuisinart’s Single Burner is your handy cooktop for parties and trips. It not only beautifies your cooking space but also comes with a host of useful features. It comes with a 6-setting temperature control for different cooking needs. The body is made of premium brushed stainless steel. The cast iron plate on this device is coil-less enabling easy cooking and mess-free cleaning. Single Burners are truly an innovation in cooking because they’ve maximized convenience and reduced cooking time considerably. Portable Single Burners are a traveler’s best friend because it eliminates the need to spend on buying food and enables cooking your favorite foods on the move without a lot of effort. Every kitchen must have a portable single burner along with a stove, oven, and other cooking range. With your portable single burner, you can go on trips to the most unlikely places and still be able to cook for your family and friends like you were at home in your kitchen.